Casa Las Palomas is sited on a private estate in Cuernavaca, Mexico, enjoying 0.46 acres (1,867 square meters) of secluded gardens, with a quietude of tall trees all around. 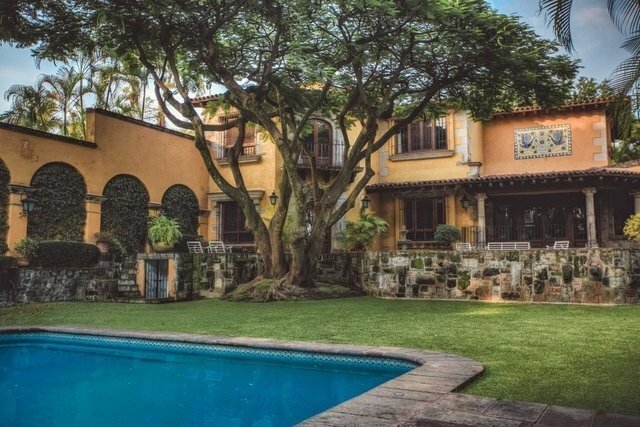 The house is designed in an attractive Mexican Colonial Revival style, with 2 spacious patios and terraces, the main one overlooking the well-manicured gardens and swimming pool. The house feels cozy yet offers ample space. Beyond the gated entrance with 24-hour security, the house is approached via a winding driveway bordered by mature plants and a charming fountain. The front of Casa Las Palomas has a gorgeous cobblestone courtyard with a two-car garage. The main entrance is decorated with a commanding Cantera archway made of reclaimed, historic stone. The house is characterized by high ceilings with exposed beams, Cantera volcanic rock floors, custom-built millwork, ornate hand-carved doors, and traditional Talavera tiling. Large windows ensure each room is bathed in plenty of natural light. The first floor of Casa Las Palomas encompasses the living room, the kitchen, the dining room, and two of the bedrooms; each with their own bathroom. The living room is completely open and has a direct access to the main terrace. The kitchen is designed with the traditional aesthetic of colonial Mexico, featuring tasteful cabinetry and Talavera tiling. Casa Las Palomas bathrooms are finished with the similar old-world tiling found in the kitchen. The master suite is located on the second floor of the house and features an attached lounge with attractive built-in cabinetry and delightful hand-stenciled detailing on the ceiling. The master bedroom benefits from a private balcony, which overlooks the gardens. The upper level is complete with the house’s third bathroom. Casa Las Palomas also includes staff quarters, which are accessed via a private entrance. This self-contained service area includes a bedroom, a bathroom, and laundry facilities. At the bottom of the garden, adjacent to the pool, a small parcel of land is currently used as an orange and lime tree orchard, with the opportunity to develop a poolside guesthouse.